This exercise work pectoralis major, triceps long head, teres major, lats and a little bit serratus anterior, rhomboids and pectoralis minor. The serratus anterior, rhomboids and pectoralis minor have the function to stabilize the scapulae (shoulder blades) and to allow the humerus to tilt over a stable support. It’s possible to do this exercise only to open the rib cage. To do this, work with lightweights and be careful to not bend your elbows too much. 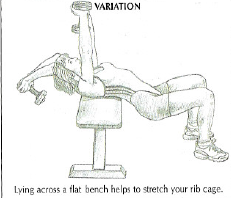 And it’s necessary to use a bench in a transverse position so that your pelvis is lower than your shoulder girdles. It’s important to inhale as much as possible at the beginning of the movement and to exhale only at the end of the movement. This guided exercise works the pectoralis major, mainly the sternal parts at the end of the movement. This guided exercise also work a little bit the triceps and anterior deltoids. Variant : By pulling out your chest and arching your back, you work more the lower part of your pectoralis major (chest). But beware, this technique is harmful for people with back problems. By lying on a bench with you head down and fix your feet so as not to slip. The bench is declined between 20° and 40° Take the barbell with a pronated grip and a hand gap equal to or wider than your shoulders. Inhale and by controlling the movement, lower the barbell on the bottom of your chest. 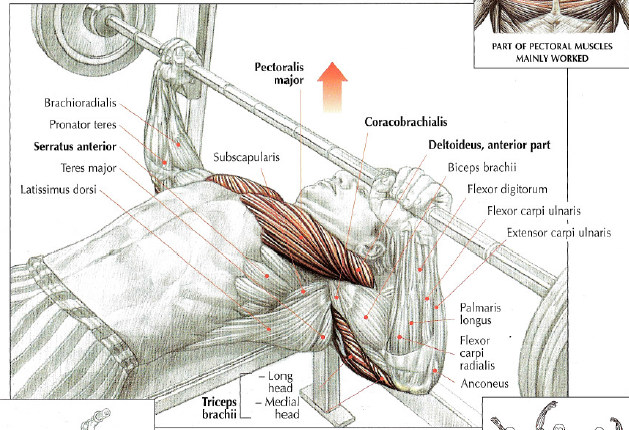 This exercise works the pectoralis major (particularly the lower part), triceps and anterior deltoids. 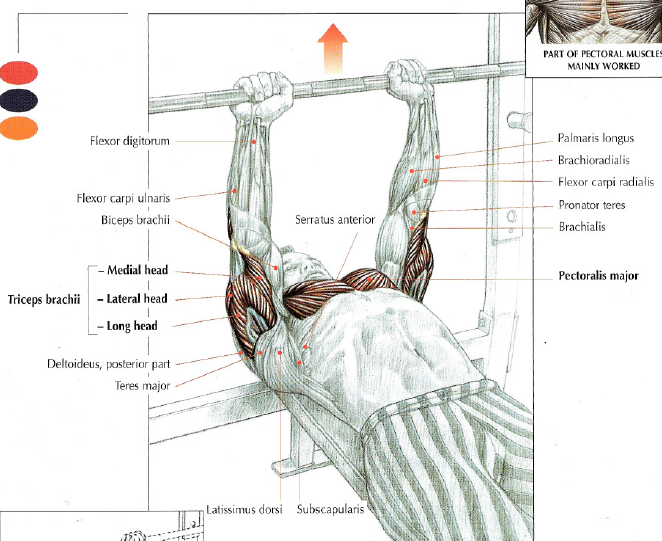 You can also to this exercise with a light weight and down the barbell at the neck. 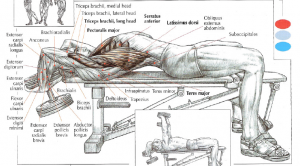 This allows you to stretch your pectoralis major (chest) in an excellent way. 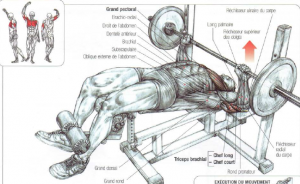 You can also to the decline press with the Smith machine. Takes the barbell with a pronated grip. The distance between your hands varies from 10 to 40 cm (3.9 to 15.7 inches) of your wrists flexibility. 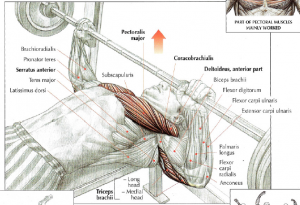 Inhale and lower the barbell by controlling the movement to your torso. Press and exhale at the end of the movement. 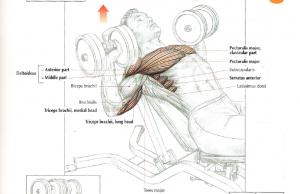 This exercise works the inner chest and triceps. 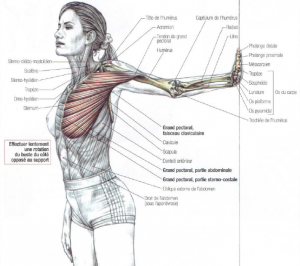 This exercise can be part of an arm training program. By doing this exercise with the elbows along your body, it allows to work more anterior deltoids. This exercise can be done at the Smith machine. Attention : There are several different morphologies so it’s possible that the close-grip create wrist pain. In this case, it’s advisable to spread the hands slightly. Takes the barbell with a pronated grip. The distance of your hands is wider than the width of your shoulder. 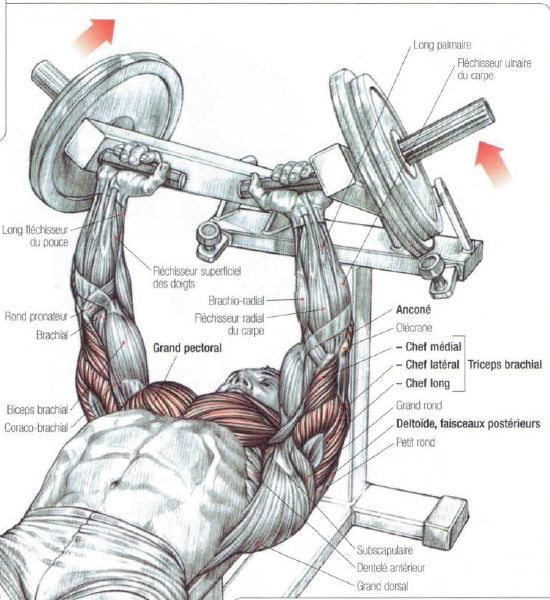 This exercice work mainly the pectorals and a little bit triceps, anterior deltoids, serratus and coracobrachialis. 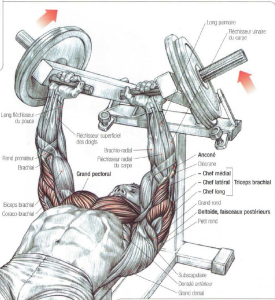 You can do this exercise by arching you back like powerlifters, This allows you to use your lower chest which are more powerful for lifting heavier weights. But you have to pay attention to your back if you want to avoid injury, caution. You ca do this exercise by making the press with your elbows along your body to work more your anterior deltoids. If you have pain in the back or you want a better isolation of the pectoral work, you can do the « press » with your legs raised. You can do this exercise with a Smith machine. Standing with your arm outstretched, grip to a support with your hand to slowy rotate your torso on the opposite side of the support. This exercise mainly works the major pectoralis, anterior deltoid and brachii biceps. Variant : It’s advisable to place your hand at several different heights to stretch all the pectoralis major’s beams. Note : It’s an excellent stretch for bench press, throw sports, volleyball and handball.